(UPTOWN CHARLOTTE, NC) -- Mark Grudzielanek, who managed the Charlotte Knights in each of the past two seasons, will return to Uptown Charlotte to lead the club for a third consecutive season in 2019. Grudzielanek's field staff will consist of returnees Steve McCatty (pitching coach), and Shawn Powell (strength and conditioning coach), as well as newcomers Frank Menechino (hitting coach), Guillermo Quiroz (coach), and Josh Fallin (head athletic trainer). 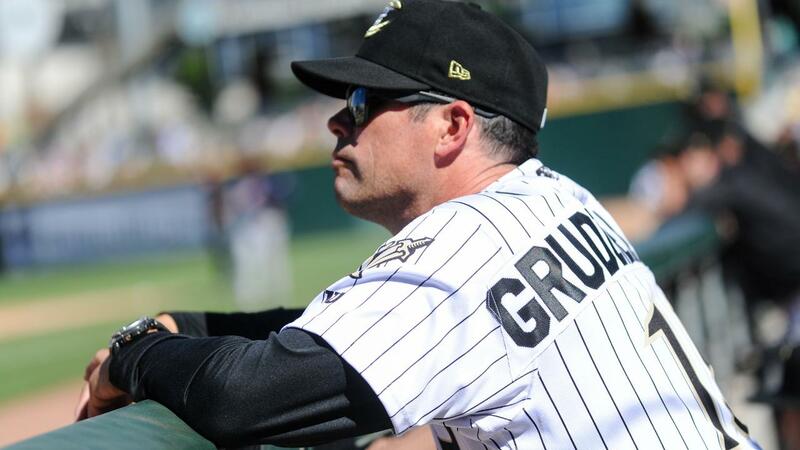 A 15-year major league veteran, Grudzielanek is set to enter his third season in the Chicago White Sox organization and fourth overall as a minor league manager in 2019. In two seasons at the helm of the Knights (2017-18), Grudzielanek has compiled a 125-156 record. Before joining the White Sox organization in 2017, the Milwaukee, WI native guided the Kane County Cougars (Single-A) to an 84-54 record and a postseason berth in 2015. In 2016, he served as an assistant coordinator in Arizona's system. Originally selected by the Montreal Expos in the 11th round of the 1991 amateur draft, Grudzielanak played for six teams over his illustrious big league career, including the Expos (1995-98), Los Angeles Dodgers (1998-2002), Chicago Cubs (2003-2004), St. Louis Cardinals (2005), Kansas City Royals (2006-2008), and Cleveland Indians (2010). In 1,802 major league games, he compiled a .289 batting average with 2,040 hits, 391 doubles, 90 home runs, 640 RBIs, and 133 stolen bases. He was a National League All-Star in 1996 and a Rawlings Gold Glove award-winner at second base with Kansas City in 2006. The 2019 season will mark McCatty's third straight with the Knights as pitching coach. A nine-year major league veteran, he compiled a 63-63 career record and a 3.99 career ERA in 221 games pitched during his entire career with the Oakland A's. In 1981, the Detroit, MI native finished second in the American League Cy Young Award voting after posting a 14-7 record and a 2.33 ERA. He led the league that season in ERA and shutouts (4), while accumulating a remarkable 16 complete games. Prior to his time with the Knights, McCatty served eight seasons as a major league pitching coach for Oakland (2002) and Washington (2009-2015). Menechino, a seven-year major league veteran, will enter his first season in the White Sox system in 2019. A native of Staten Island, NY, Menechino spent the past five seasons with the Miami Marlins as hitting coach (2014-18). Originally selected by the White Sox in the 1993 amateur draft, Menechino appeared in 449 big league games over his career with Oakland (1999-2004) and Toronto (2004-05). He hit .284 with 83 home runs and 476 RBIs over parts of 12 minor league seasons. Quiroz, 37, will embark on his second season in Chicago's organization and first with the Knights in 2019. Last season, the Maracaibo, VZ native made his coaching debut with the Winston-Salem Dash (High-A) following his retirement as a player. Quiroz appeared in parts of 10 major league seasons with Toronto (2004-05), Seattle (2006, 2009-10), Texas (2007), Baltimore (2008), Boston (2012), and San Francisco (2013-14). A member of San Francisco's 2004 World Series championship team, Quiroz appeared in a total of 148 games over the course of his big league career. Fallin is set to begin his first season with the Knights and 21st overall in the White Sox system in 2019. Last season, the New Mexico State University product completed his 16th overall campaign as the head athletic trainer for Winston-Salem. A native of Abilene, TX, Fallin is a three-time Carolina League Trainer of the Year. He also earned Southern League Athletic Trainer of the Year honors in 2012. Powell, a native of Brighton, IL, will enter his eighth season in Chicago's system in 2019 and fourth straight with the Knights. Before spending the 2016 season with Charlotte, the Western Illinois University product spent the previous two seasons as the strength and conditioning coach in Winston-Salem. Before that, he spent time in the same capacity with Birmingham (2013-14). Powell has also worked for the NBA's Toronto Raptors as a strength and conditioning consultant (2005-05), and the New York Yankees as a strength and conditioning coach (1989-99).